When trying to attract finches, it can be feast or famine. Some days you get bunches and bunches, other times you might feel totally rejected by them. I recently had a conversation with a colleague who works for the Department of Natural Resources. He’s a smart guy, a wildlife biologist and what he knows about native swans is incredible, but what he knew or didn’t know about bird feeding was surprising. We were talking about the high price of seed and that he purchased some finch food and the birds didn’t come. I asked where he purchased the food from and it was a well known “big box” store. I told him that the chances were good that the seed was most likely old and finches will not eat it. Nyjer (also known as Niger and Thistle) is not grown in the US, though it is possible. Most of it comes from Singapore, Ethiopia and Burma. 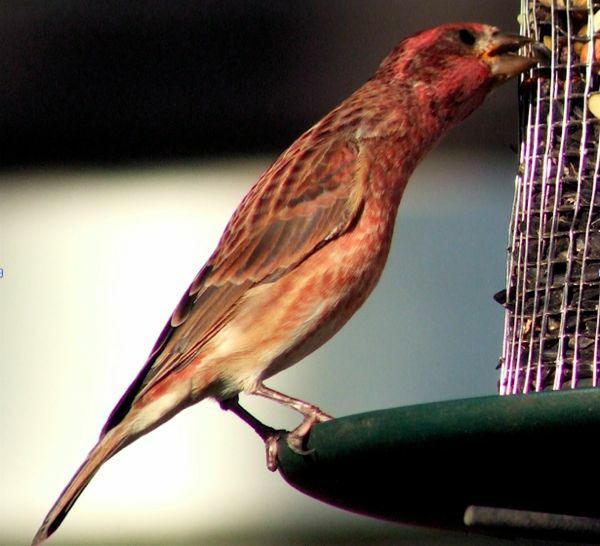 Once the seed is six months old after being picked, the finches are less likely to eat it. Most wild bird types stores like your Wild Birds Unlimited or Wild Birds Centers will work with their seed distributor to get the freshest crop, once that crop reaches a certain age, the distributor will sell it at a discount to places like hardware stores who would prefer to offer cheaper older seed than fresh seed. That’s one of the reasons wild bird store seed tends to be more expensive (they are purchasing smaller quantities and purchasing the freshest seed possible). That store wasn’t feeding him a line, it’s true. I ran a bird store for eight years. So it’s best that when you purcase Nyjer/Niger/Thistle that you always purchase small quantities and purchase often. You can get away with older sunflower but not that tiny finch seed. You know, if that is too much for you to think about, you can always just use sunflower seeds. Even those tiny goldfinches will eat it along with other birds–note the American Goldfinch in photobombing the male and female Northern Cardinals? The separate feeder is nice because it gives the finches their own place to feed without being intimidated or bullied by larger birds. I also find that birds like Purple Finches prefer it over Nyjer too. But they are also a beefier finch and less likely to put up with shenanigans from other birds. Another reason you may not have finches is just plain old seasonal movement. I’ve been doing three different fall bird surveys. And the last few weeks have been chock full of birds. I’ll either be flying over thousands of Canvasbacks or standing in a cornfield surrounded by hoards of native sparrows or whirling flocks of Eastern Bluebirds and American Pipits. Then this week I did a survey and saw nary a bird. For most of my point counts I was lucky if I heard a distant American Crow or solitary Horned Lark. I felt so lonely out in the field. But birds are booking south and some days you will have a ton and some days you’ll have very little. If your food is fresh and providing your feeder isn’t filthy dirty like the above feeder with all the goldfinches. Remember birds don’t like eating off of dirty dishes any more than you do but will when they have fewer options. Dirty feeders can spread disease. Finches travel around in large nomadic flocks. 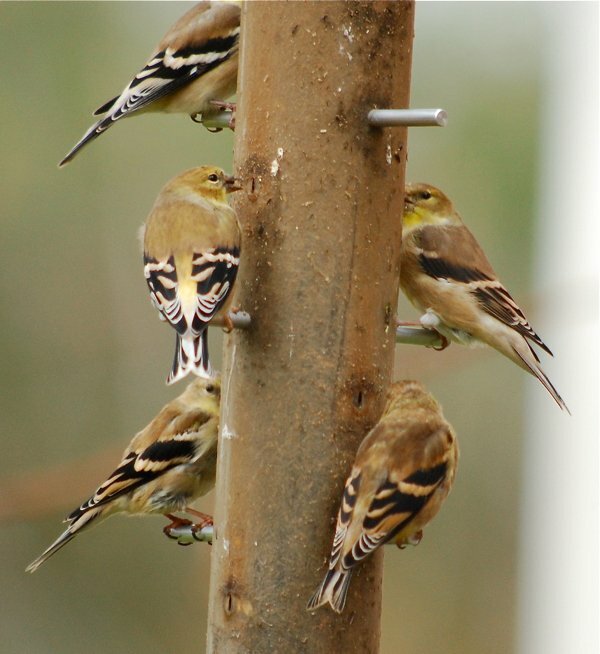 If you have oodles of finches at your feeder all day long that is most likely several flocks of birds that have your feeding station on their RADAR and include it in their daily route. So take heart if you are low on birds hope that this year’s Winter Finch Forecast is in your favor you’ll get tons of Pine Siskins. There are also lots of YouTube finch videos so you can always get your finch fix there too. Speaking of feeding birds, consider signing up for Project Feeder Watch and using the birds in your yard for winter bird trends. Sharon, That is exactly what happened to me last year. I had about 10 lbs of Nyjer seed left over, and the goldfinches would peck at it and leave. Corey set me straight and with new seed, I had a bunch of goldfinches within a day or so. NEVER KNEW THAT Never too old to learn. I’m hoping this is all that’s going on with my feeders. The feeders are clean but the seed came from Walmart. I haven’t had any problem before this year but I think I did notice they moved their seeds out into the garden center which I know got way too hot this year. I’m going to try dumping the remaining seed and refilling with new seed and see what happens. I’ve noticed that goldfinches in particular have no trouble showing you when your feeder is a little to dirty for them. In most cases, I would really have to look closely to see the problem. I am still feeding our finches in November and December..Is ths ok to still be feeding them? I hope I am not hurting the migrating process. I do not want to harm the pretty little birds. Filled my finch sock with seed and the finches are out there eating at the safflower but for weeks no one has ever landed on the sock. I don’t think they know what it is. Do finch socks work? Or do I need to putt little finch sock lobbyists out at the safflower feeders to coax the finches over? The sock is full of nyjer. The other feeder has the safflower. That sock just looks like a pretty dead white log. Surprisingly I have been purchasing my thistle socks from a discount store and I can hang 2 socks and they will be empty in two days. I have counted as many as 12 goldfinches on the two socks at one time! Thank you so much for everyone’s input!! I have grown Sunflowers for years and have had the pleasure of 7 beautiful Goldfinch. This year my Sunflowers are not up yet and I have many more Goldfinch. I now have a feeder with the correct seed and the Goldfinch are in the tree and not one has come to the feeder. Thank you so much for all if your input. I will go to a speciality store. I plant sunflowers around my house, the finches love them! , end of season now. I only see one finch. I miss them. Do finches and sparrows get along ok? My goldfinches have gone bye bye for some reason … But remember they turn a darker color at this time of the year … I am in Austin Texas … Where are they?? Do they migrate? My hummingbirds are gone as well! But beautiful cardinals are still here. Tons of those silly sparrows tho! But zero bugs outside! My goldfinches have disappeared as well. Plenty of fresh seed in clean feeders too. Hope they show up again when it turns colder! I set up a finch feeder about 1.5 months ago and have had no activity at it at all. I have something yellow on it to attract finches, I shake it to keep the Nijer from sticking together, and I change the unbeaten food out every 2-4 weeks. I have not tried just buying a new bag of Nijer. Is there a chance I just need to move the feeder somewhere more favorable? Where can I find more information on where around my building they might prefer to feed? Do they prefer overhead cover or not, etc. 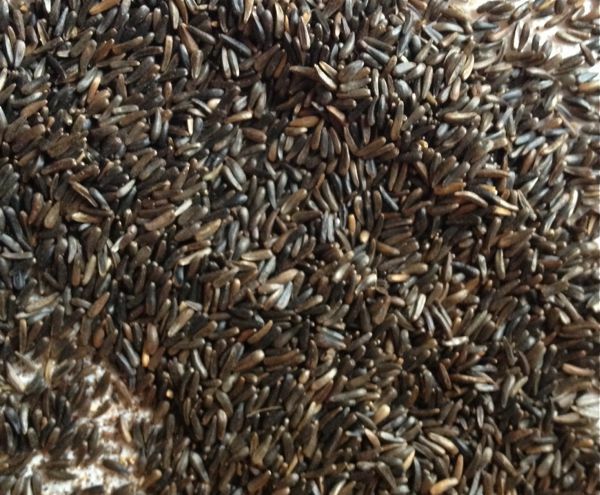 If you’ve got seed that’s still shiny (oily, fresh), your feeders are clean and you have cover reasonably close there’s no reason they shouldn’t be finding it. I’m still without more than 1 or 2 here in Nashville. I have two birdfeeders full of nyer seed and the goldfinches ate it. Then they were empty for 2-3 days and they didn’t come back. I counted 8 goldfinches in my birdfeeders at the begining. I don’t think is the food. Could they be disturb for other birds or something? We have what I believe to be, a yellow male finch. He is a beautiful bright yellow bird. He has been tapping at our windows for over a month. I think he may be looking for a mate. We live on a farm and have an indoor/outdoor cat. For this reason I have never fed birds or tried to attract them. I feel so sorry for this bird. Can I attract other finches to my home safely? live in Indiana had bird feeder up for three yr. had good turn out up until now 4-14=2017 birds are just gone new feed clean bird feeders . what happen I don’t know. puzzild in Indiana. TIPS! – Your seed should be BLACK, not brown. If your seed isn’t working, it may be too dry. Put it in a plastic bag and add a little shot of sunflower oil (or regular vegetable oil if that’s all you have). It should rehydrate the seed and make it tasty to them again. Nyger seeds have shells and are basically just little tiny sunflower seeds. If you’re still not having luck, they may just be spoiled. If that’s the case, return them. ALWAYS KEEP YOUR RECEIPT! 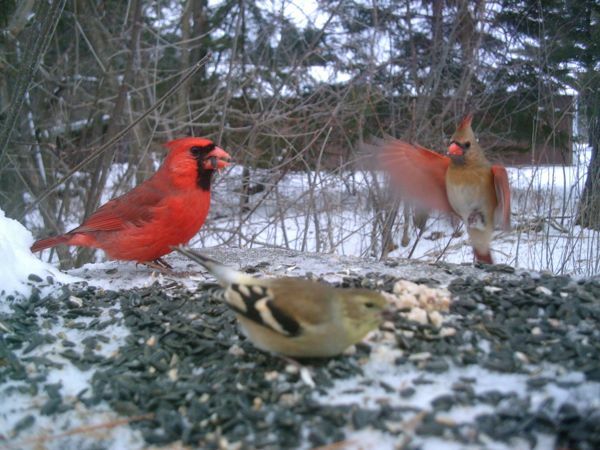 Next – Try scattering some seed on the ground around the yard to attract them better. Do the vegetable oil trick on your cheap seed to make it more inviting. I even go as far as to add a little peanut butter POWDER to really real them in. It’s ok if it gets a little dirt on it, birds need a little dirt to digest anyway. Also – Make sure your feeder isn’t too close to another feeder (like a hummingbird feeder). They’re very territorial and will stay away if it’s placed on some other birds “turf”. About 20 years ago I had a dead sock that just didn’t work. I had no idea why. Now I know it was spoiled seed. I put out a new one a few weeks back and it is literally CRAWLING with gold, yellow, purple, red finches and even a few I swear look green. If you’re still not getting any, it may be the wrong season or you may even have a Hawk in the area picking them off. Be persistant and they should eventually show up. When they do, don’t be afraid to take down your sock every now and then. Especially if you see any diseased ones. Don’t worry, they’ll know you have the best seed in town and will visit again.